Well, so much for spooking anyone from swimming in the ocean, as fall is effectively upon us. Don’t blame the Daves though, as the tardiness of this review falls entirely on my head. I’ll start out by saying this is the best-looking Blu-ray I have ever seen, and that isn’t because it is also, hands down, my favorite film. In this day and age, I highly doubt this is necessary, but beware of spoilers to come. I can barely believe the transfer on this film. 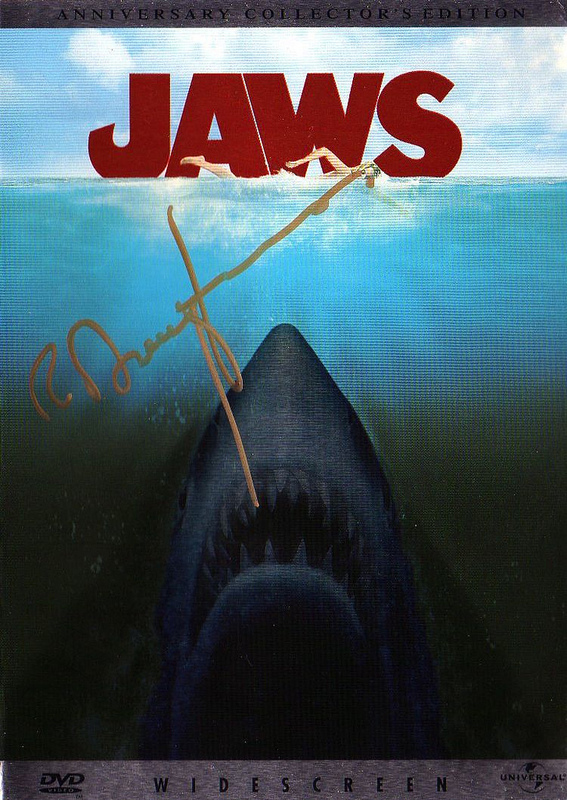 There is a documentary – JAWS: The Restoration – that I highly recommend watching before viewing the upgraded film. It explains almost every facet of how Universal’s achieved this milestone – but does have quite a few spoilers if you’ve never seen JAWS. What had to be done in order to make this film look the way it does was an absolute labor of love, so kudos and thanks to everyone involved. 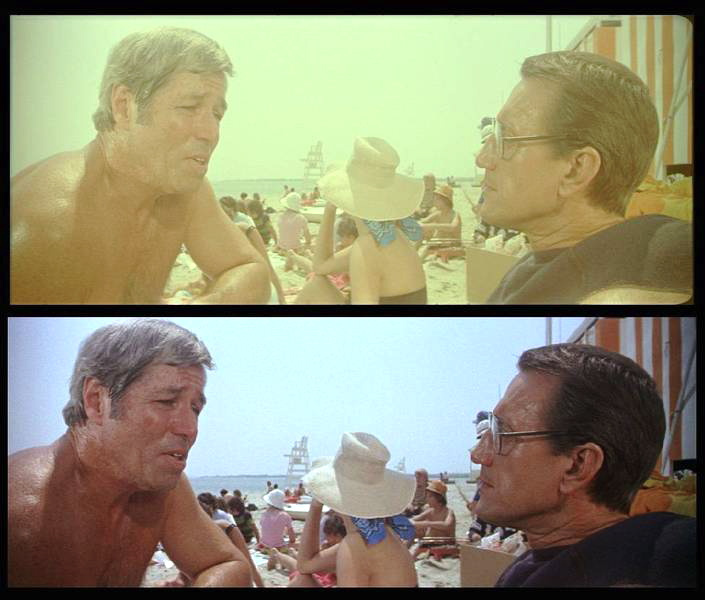 Not only have they made JAWS look fantastic, hopefully this will provide the standard for future film upgrades. 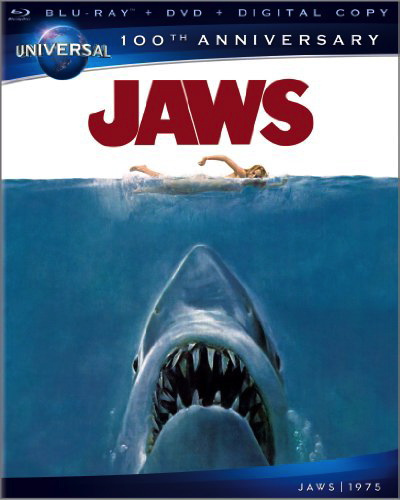 If you’ve already seen JAWS, you are now going to notice things you never had and/or were unable to see. Where the old transfer was scratchy and dark – even in shots on the beach in full sunlight – now each scene is crisp and bright. In addition, the frames have been significantly widened to include huge details previously cropped out. You are going to see a lot more instances of Falstaff beer, so you might even turn this into a “take a shot every time you see a can of Falstaff” drinking game! So, the first thing I noticed via the newly instated brightness of the film is that the first two kills are brutal! The first death (Chrissie the skinny dipper and first victim) is actually kind of hard to watch. I’m sure the enhanced soundtrack adds to it, but you REALLY see her being violently jerked around by the shark. And, as for Alex, aka – the doomed “Little Kintner Boy – you clearly see the first time the shark shows up on screen, and the kid’s takedown is a doozy. Everything else looks absolutely gorgeous. 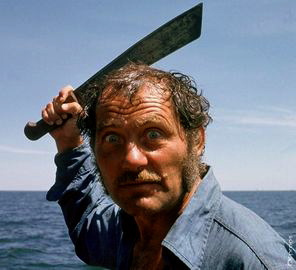 Once the boys – Sheriff Brody (Roy Scheider), Matt Hooper (Richard Dreyfuss), and the legendary Robert Shaw as the insane Captain Quint – are out on the Orca, be prepared to hit rewind. There are all kinds of intricate details of the ship, the equipment, and the motley crew’s interactions that will make you do a double take. Particularly, the small details of Quint’s death make it an even bigger event. Were this George Lucas, he probably would have digitized the heck out of the shark and made it talk with a fake German accent. Steven Spielberg chose to leave everything but the visual refurbishments untouched and, though JAWS himself sometimes looks like a big rubber shark, it only adds to the charm. Extra bonus, you get to see people smoking in a hospital AND around oxygen tanks, so Spielberg doesn’t pull any E.T. “let’s switch out the guns for flashlights”, tricks. The Exorcist Blu-ray transfer was as good as I thought it could get and, while it does look great, it doesn’t compare to the JAWS upgrade. As I watched the film, it seemed like it was a longer movie than was presented on the original DVD, but they are the same length. I think all the new details to take in just made me hit rewind so much that it took longer to get through (even upon the second viewing). If you are still with me at this point, long story short, I highly recommend you go buy a copy immediately. I’m going to try to avoid spoilers here, because this is a real goldmine for JAWS fans, but continue at your own risk. If you own the old Anniversary Collectors Edition disc, don’t worry too much as the only things removed are the Get Out of the Water! Trivia Game, the skimpy JAWS World supplement, and the cheesy screen saver. But, what you are getting is hours and hours of substantial bonus material. This is the crown jewel of the extras. 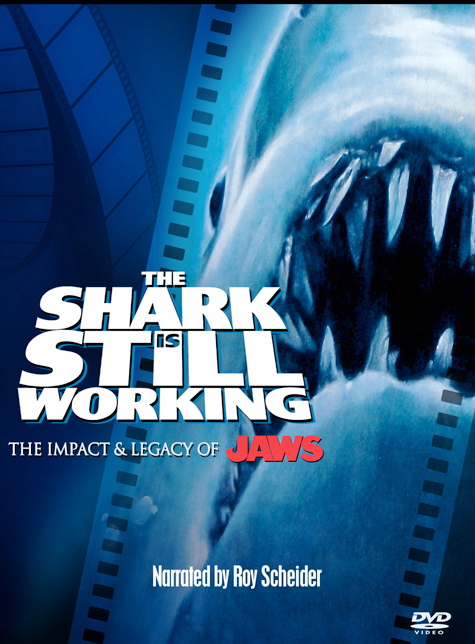 If you are unfamiliar with it, see: http://en.wikipedia.org/wiki/The_Shark_Is_Still_Working (or just buy the Blu-ray). This is a fan base at it’s most dedicated and provides a documentary about the film that covers just about every aspect you could ever imagine. 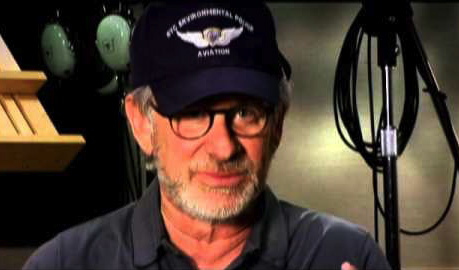 Narrated buy our guy, Roy Schider, it features everyone from Stephen Spielberg to John Williams to the guy who had 2 minutes onscreen as the Amity harbormaster to Charlie Benante from Anthrax. So, you probably get an idea of how thorough this thing is. The casting, actors, characters, locations, special effects and everything in between have a part in the narrative. 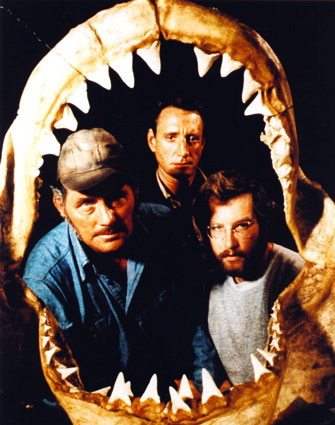 Special attention is paid to Robert Shaw, and how he was apparently extremely hard on Richard Dreyfuss. Even Dreyfuss admits that this constant turmoil brought a magnificent performance out of him – but it apparently still makes him a little uncomfortable talking about it. Not to give too much away, but an entire chapter is devoted to the JAWS theme, with John Williams providing a lot of background (though I’d have liked to have heard even more). Personally, I always thought the soundtrack was as much the star of the show as the shark. In addition, another chapter is devoted to Quint’s telling of the story of the sinking of the U.S.S. Indianapolis. 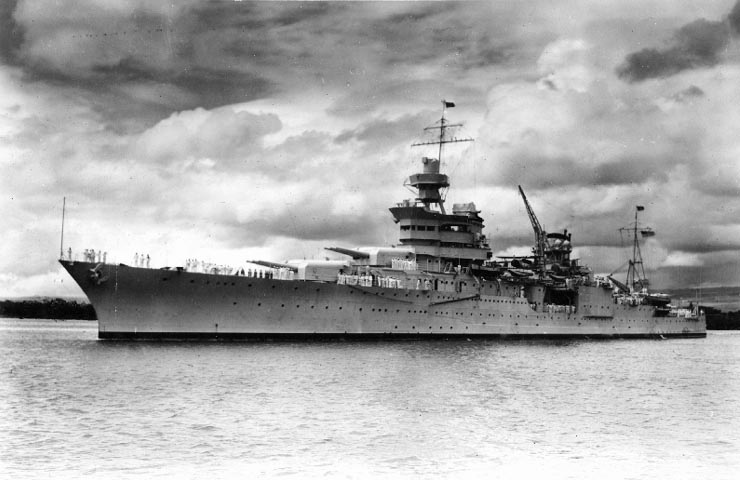 If you don’t know the full historical significance of the Indianapolis (and you’ll have a good idea, once you watch JAWS), I recommend you take a read through this after you watch the movie: http://en.wikipedia.org/wiki/USS_Indianapolis_%28CA-35%29 To me, this scene is the real heart and soul of the entire story and explains who Quint is and why he does what he does. While probably not something you’ll watch again and again, the Blu-ray provides about four times as much deleted material as the original DVD. The icing on the cake here, for me anyway, is the wealth of material around the mythology behind Quint. 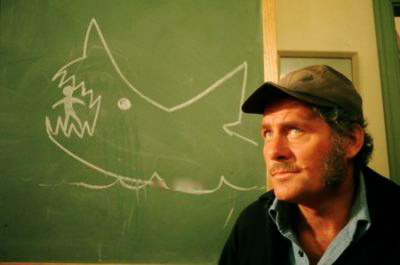 You’ll fully understand why he took Hooper and Brody out to find the shark instead of a crew he’d worked with before. You’ll also find out more about Mrs. Kintner (the second victim’s mother) and the seedy underbelly of the town of Amity. 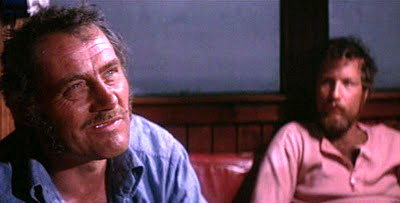 The outtakes are not much to write home about, though there is a pretty nasty one of multiple takes of Robert Shaw’s bloody end. My only beef with this disc is, they didn’t break this section’s material up into segregated parts where you could pick and watch a single deleted scene versus watching the entire set. It seems that this would take very little effort to achieve – but a very small complaint, overall. The remaining extras are things like marketing materials, storyboards, trailer, production photos, etc. However, there is much more material than on the DVD. This is very interesting stuff, and worth at least one pass through. Aside from The Shining, I swear JAWS had the second best horror trailer ever. Also included in the package are a DVD version (why?) and a downloadable copy. The final verdict is, JAWS as a historical benchmark in cinema has been done full justice and is the finest reissued horror Blu-ray since Evil Dead II. I’d love to see JAWS II done up as nicely, but that may be a stretch. Buy it, watch it, and think twice about getting in your bathtub! This entry was posted in DVD/Blu-Ray Review, Man vs Nature! and tagged JAWS, JAWS Blu Ray. Bookmark the permalink. ← “Bad-Off Boris & the Cupcake Cave-in”: Monster Inspired Book with “Universal” Concepts!